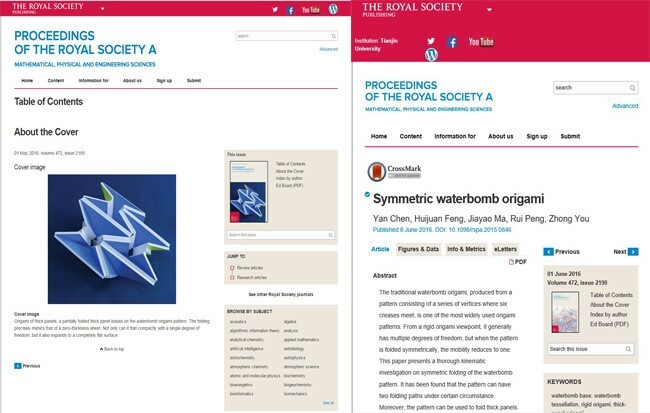 Professor Yan Chen and her team published their research about symmetric waterbomb origami on Proceedings of the Royal Society A (RSPA) as the journal cover paper on June 8, 2016. RSPA is one of the leading journals in the world with a history of more than 350 years. After originally proposing the theory of thick panel origami, the team further applied it to the analysis of the traditional waterbomb origami with six-crease bases, which is one of the most widely utilized origami patterns. The paper presents a thorough kinematic investigation into the symmetric folding of the waterbomb pattern. It is found that the pattern can have two folding paths under certain circumstance by treating the waterbomb patterns of zero-thickness sheets and thick panels as networks of spherical 6R linkages and spatial overconstrained linkages, respectively. We can choose the proper geometric parameters to design the pattern according to practical needs. Moreover, the pattern can be readily used to fold thick panels with a single degree of freedom, and the motion of thick panels is the same as the origami of zero-thickness sheets. Not only can the pattern fold compactly with a single degree of freedom, but it also expands to a completely flat surface, which paves the way for the pattern being instantly applied to package deployable structures ranging from flat roofs to large solar panels. At present the team is working with aerospace institutions on utilizing the theory to fulfil the folding and expanding of rigid paraboloid antennas.